Indians Caught Defecating in Open Garlanded, Fed With Sweets! 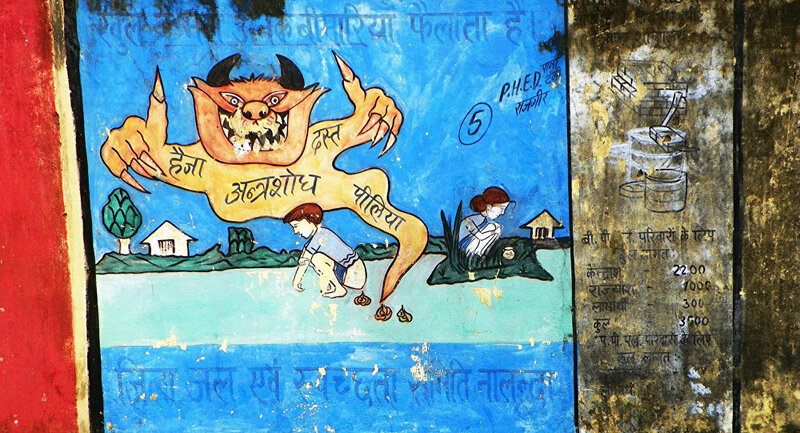 Authorities in the Indian town of Aligarh, where open defecation is still rampant, aim to replace strict methods of policing with 'sarcastic persuasion' hoping to focus on bringing about a change in the local population's behavior. New Delhi (Sputnik) – In a unique approach to curb open defecation, authorities of a small town in the Indian state of Uttar Pradesh have started a drive wherein people caught answering nature’s call in the open are "honored" with garlands and fed deserts. The Aligarh municipal authority believes that this form of sarcastic persuasion will work better as it will inculcate a sense of embarrassment as well as guilt in the culprits, deterring people from repeating the act. The day of 'Diwali' was chosen as the day to start this drive as the festival is generally associated with cleanliness – cleansing our surroundings and our souls of dirt and evil. "It is a festival of cleanliness. We began this triggering exercise wherein we are urging people to not defecate in the open. We are distributing sweets to those defecating in the open with the aim to request them not to do so," Municipal Commissioner of Aligarh Santosh Kumar Sharma said. The drive was keenly appreciated by most people and it received a standing ovation on Twittersphere. — ANI UP (@ANINewsUP) 19 октября 2017 г. "We were asked not to defecate in open and use toilets and they also gave us laddoos (an Indian sweet)," one of the youths found defecating in open Shiv Kumar said. The Aligarh Municipal Corporation has made special arrangements of mobile toilets for people who do not have toilets in their home. A total of eight teams were deployed in different areas of Aligarh for the purpose. We have to inculcate a need for toilets. When we achieve that, people themselves would construct their own toilets," Sharma said. The 'Clean India Mission' envisioned by Prime Minister Narendra Modi aims to declare India 'open defecation free' by the year 2019.